Advantages: Well respected writer, excellent format, first-hand accounts, easy to read style, superb artwork. With an aircraft as numerous as the SE5/5a, it was only a matter of time before it featured as a title in its own right. This then is the latest in the Osprey Aircraft of the Aces series. There is a lot of information contained within the 96 pages which is not surprising as almost 100 aces flew in the type. Nearly 115 black and white photographs are interspersed throughout the book with each one carefully selected for its relevance. There are 31 colour profiles with a further 6 plan views to illustrate the aircraft those aces flew. Harry Dempsey is responsible for these and they are superb. Eagle-eyed viewers will note that his style of rendering has changed over previous representations of this machine. Speaking of which, it is not surprising that six of the aircraft have been seen in previous books in this series. All things considered this seems a reasonable ratio. The volume starts with a look at the flying qualities of the “Scout Experimental 5” before focusing on its introduction to 56 Squadron. This newly created unit contained 26 aces that piloted the SE5/5a, including such luminaries as McCudden, Bowman, Rhys Davids and Hoidge. The second unit to receive this fighter was No.60 Squadron when it replaced its Nieuport 17s and 23s in June 1917. No.84 Squadron followed suit and rounds out the chapter with its acquisitions in August of that year. The book then continues to present each of the other formations that used this important aircraft. Not forgotten is the Middle East where Nos.17, 111, and 150 Sqn. all had aces flying far from the Western Front. Norman Franks presents the information in a style that belies the subject’s technical nature. By mixing in personal accounts from the participants themselves, the author relates their stories in an easily digestible way. The appendices give a helpful list of aces as well as the units they served with. Not only is the flyers’ total number of victories given, but the table breaks it down into conquests that occurred within both their squadron and the SE5/5a as well. 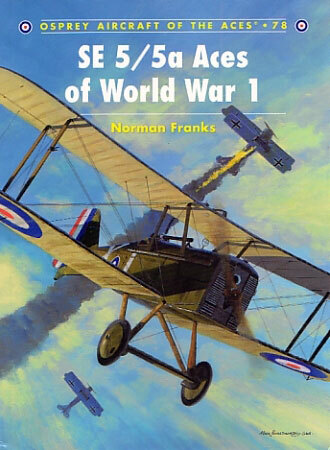 For a pleasant, laid back look at those airmen who mastered the SE5/5a, this is an excellent read. The layout of the book makes it an essential source for enthusiasts to quickly and easily look up a particular participant. The comprehensive index adds to this with each significant mention of a pilot, squadron or aircraft serial number getting an entry. Thus it becomes a very welcome addition to the other WWI titles in this series.